The spectral lines of mercury vapor lamp at wavelength 546.1nm,showing anomalous Zeeman effect. A. Without magnetic field. B. With magnetic field, spectral lines split as transverse Zeeman effect. C. With magnetic field, split as longitudinal Zeeman effect. The spectral lines were obtained using a Fabry-Perot etalon. This animation shows what happens as a sunspot (or starspot) forms and the magnetic field increases in strength. The light emerging from the spot starts to demonstrate the Zeeman effect. The dark spectra lines in the spectrum of the emitted light split into three components and the strength of the circular polarisation in parts of the spectrum increases significantly. This polarisation effect is a powerful tool for astronomers to detect and measure stellar magnetic fields. The Zeeman effect (/ˈzeɪmən/; Dutch pronunciation: [ˈzeːmɑn]), named after the Dutch physicist Pieter Zeeman, is the effect of splitting of a spectral line into several components in the presence of a static magnetic field. It is analogous to the Stark effect, the splitting of a spectral line into several components in the presence of an electric field. Also similar to the Stark effect, transitions between different components have, in general, different intensities, with some being entirely forbidden (in the dipole approximation), as governed by the selection rules. Since the distance between the Zeeman sub-levels is a function of magnetic field strength, this effect can be used to measure magnetic field strength, e.g. that of the Sun and other stars or in laboratory plasmas. The Zeeman effect is very important in applications such as nuclear magnetic resonance spectroscopy, electron spin resonance spectroscopy, magnetic resonance imaging (MRI) and Mössbauer spectroscopy. It may also be utilized to improve accuracy in atomic absorption spectroscopy. A theory about the magnetic sense of birds assumes that a protein in the retina is changed due to the Zeeman effect. When the spectral lines are absorption lines, the effect is called inverse Zeeman effect. Historically, one distinguishes between the normal and an anomalous Zeeman effect (discovered by Thomas Preston in Dublin, Ireland). The anomalous effect appears on transitions where the net spin of the electrons is an odd half-integer, so that the number of Zeeman sub-levels is even. It was called "anomalous" because the electron spin had not yet been discovered, and so there was no good explanation for it at the time that Zeeman observed the effect. At higher magnetic fields the effect ceases to be linear. At even higher field strength, when the strength of the external field is comparable to the strength of the atom's internal field, electron coupling is disturbed and the spectral lines rearrange. This is called the Paschen-Back effect. In the modern scientific literature, these terms are rarely used, with a tendency to use just the "Zeeman effect". are the total orbital momentum and spin of the atom, and averaging is done over a state with a given value of the total angular momentum. , in which case the atom can no longer exist in its normal meaning, and one talks about Landau levels instead. There are intermediate cases which are more complex than these limit cases. Note in particular that the size of the energy splitting is different for the different orbitals, because the gJ values are different. On the left, fine structure splitting is depicted. This splitting occurs even in the absence of a magnetic field, as it is due to spin-orbit coupling. 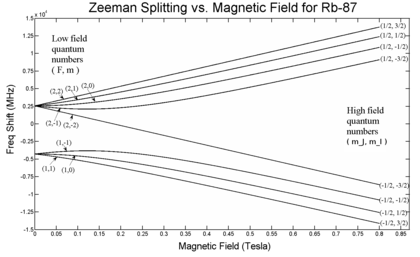 Depicted on the right is the additional Zeeman splitting, which occurs in the presence of magnetic fields. , the two effects are equivalent. The effect was named after the German physicists Friedrich Paschen and Ernst E. A. Back. ), these three components are actually groups of several transitions each, due to the residual spin-orbit coupling. will be constant within a given level. ), so this formula is fairly accurate. George Ellery Hale was the first to notice the Zeeman effect in the solar spectra, indicating the existence of strong magnetic fields in sunspots. Such fields can be quite high, on the order of 0.1 tesla or higher. Today, the Zeeman effect is used to produce magnetograms showing the variation of magnetic field on the sun. The Zeeman effect is utilized in many laser cooling applications such as a magneto-optical trap and the Zeeman slower. Electron configuration says at subshell p (l=1), there are 3 energy level ml=-1,0,1, but we see only two p1/2 and p3/2. for subshell s(l=0), there is only 1 energy level (ml=0), but here we have 2. l corresponding to fine structure, ml corresponding to hyperfine structure. ^ Thalau, Peter; Ritz, Thorsten; Burda, Hynek; Wegner, Regina E.; Wiltschko, Roswitha (18 April 2006). "The magnetic compass mechanisms of birds and rodents are based on different physical principles". Interface [on-line journal of the Royal Society of London]. 3 (9). ^ Preston, Thomas (1898). "Radiation phenomena in a strong magnetic field". The Scientific Transactions of the Royal Dublin Society. 2nd series. 6: 385–342. ^ Griffiths, David J. (2004). Introduction to Quantum Mechanics (2nd ed.). Prentice Hall. p. 247. ISBN 0-13-111892-7. OCLC 40251748. ^ Woodgate, Gordon Kemble (1980). Elementary Atomic Structure (2nd ed.). Oxford, England: Oxford University Press. pp. 193–194. ^ First appeared in: Breit, G.; Rabi, I.I. (1931). "Measurement of nuclear spin". Physical Review. 38 (11): 2082–2083. doi:10.1103/PhysRev.38.2082.2. Zeeman, P. (1896). "Over de invloed eener magnetisatie op den aard van het door een stof uitgezonden licht" [On the influence of magnetism on the nature of the light emitted by a substance]. Verslagen van de Gewone Vergaderingen der Wis- en Natuurkundige Afdeeling (Koninklijk Akademie van Wetenschappen te Amsterdam) [Reports of the Ordinary Sessions of the Mathematical and Physical Section (Royal Academy of Sciences in Amsterdam)] (in Dutch). 5: 181–184 and 242–248. Zeeman, P. (1897). "On the influence of magnetism on the nature of the light emitted by a substance". Philosophical Magazine. 5th series. 43: 226–239. Zeeman, P. (11 February 1897). "The effect of magnetisation on the nature of light emitted by a substance". Nature. 55 (1424): 347. Bibcode:1897Natur..55..347Z. doi:10.1038/055347a0. Zeeman, P. (1897). "Over doubletten en tripletten in het spectrum, teweeggebracht door uitwendige magnetische krachten" [On doublets and triplets in the spectrum, caused by external magnetic forces]. Verslagen van de Gewone Vergaderingen der Wis- en Natuurkundige Afdeeling (Koninklijk Akademie van Wetenschappen te Amsterdam) [Reports of the Ordinary Sessions of the Mathematical and Physical Section (Royal Academy of Sciences in Amsterdam)] (in Dutch). 6: 13–18, 99–102, and 260–262. Zeeman, P. (1897). "Doublets and triplets in the spectrum produced by external magnetic forces". Philosophical Magazine. 5th series. 44 (266): 55–60. doi:10.1080/14786449708621028. Forman, Paul (1970). "Alfred Landé and the anomalous Zeeman Effect, 1919-1921". Historical Studies in the Physical Sciences. 2: 153–261. doi:10.2307/27757307. JSTOR 27757307. Griffiths, David J. (2004). Introduction to Quantum Mechanics (2nd ed.). Prentice Hall. ISBN 0-13-805326-X. Liboff, Richard L. (2002). Introductory Quantum Mechanics. Addison-Wesley. ISBN 0-8053-8714-5. Sobelman, Igor I. (2006). Theory of Atomic Spectra. Alpha Science. ISBN 1-84265-203-6. Foot, C. J. (2005). Atomic Physics. ISBN 0-19-850696-1. Wikimedia Commons has media related to Zeeman effect.